The Raging Bull of Italy has unveiled three Huracán models since the dawn of 2019. First in early January, the diet Huracán Evo. Second, a Salon International de la Haute Horlogerie Huracán Performante with Roger Dubius, and the third yesterday, an exotic drop-top called the Huracán Evo Spyder. 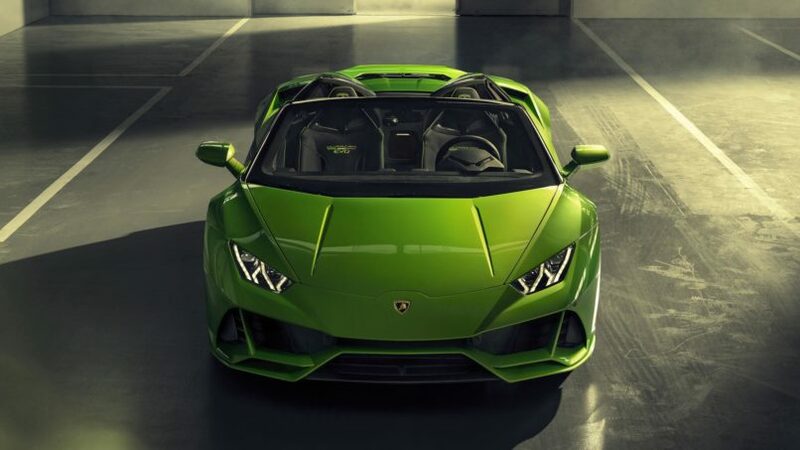 The last time the Italians architected a convertible was nearly three years ago, with the glorious Aventador. Lamborghini prefers having a closed cockpit for their supercars, simply because power-gliding at 202-mph requires a safe and closed cabin. 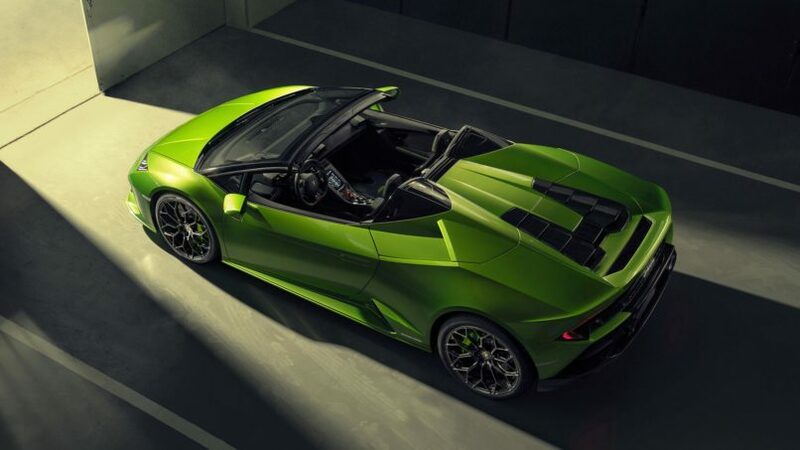 The Huracán Evo Spyder is a Lamborghini convertible, a rare breed, whose official unveiling is scheduled for next week at the Geneva Motor Show. In terms of updates from its standard Evo variant, the Spyder sports the same exterior detailing. With headlights that look you dead in the eye, and a slightly deeper nose-dip, the Spyder is almost visually identical to the standard Evo. 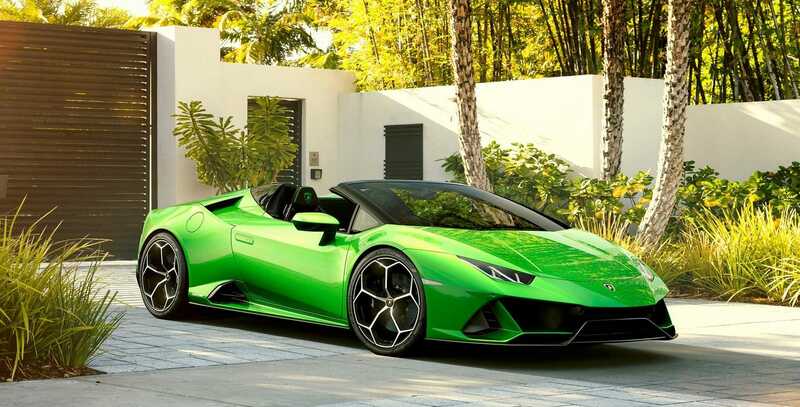 Notably, the Huracán Evo Spyder’s serpentine green paintjob is strikingly attractive – it could suggest a new neon colour palette coming with this model. Pop the hood and you’ll see the trademark 631-HP V10 guzzler that shreds upto 600Nm of torque, a drivetrain sported across all Huracán models. In comparison with its predecessor, the Spyder compromises just 0.2 seconds when short-sprinting 0-60 mph, clocking in at 3.1 seconds. Which is impressive considering it bulks up by 120 kgs. This drop-top can peak at 201 mph, with a roof closed of course. Outside, you’ll see the automatic pop-up rollover bars are hidden behind the seats, while the rear window can be retracted electrically whether the roof is up or down, allowing the car’s engine note to be more prominent to those in the cabin. Lamborghini’s updated chassis technologies, including rear-wheel steering and four-wheel torque vectoring, transfer unchanged to the Spyder. The Italians seem quite proud of building such an aerodynamic masterpiece, with more than five times the downforce and aero efficiency of the old Huracán. Inside, the Spyder flexes the same Cutting-edge 8.4” touchscreen as the Evo, replacing all knobs and buttons. There isn’t an official verdict on when the convertible Huracán will make an on-road debut but it is speculated to happen somewhere around the first quarter of 2020. While the Huracán Evo is priced at Rs 3.7 crore in India, the Spyder could plate in with around a five percent price-drop, roughly Rs 3.5 crore.